Famil Sadygov has been appointed Deputy Chairman of the Gazprom Management Committee. He will oversee financial and economic activities. Famil Sadygov was born in 1968 in Nakhichevan. He graduated from the Sergo Ordzhonikidze State Academy of Management in Moscow. He has a PhD in Economics. 1999–2004: Deputy Minister of Taxation of the Russian Federation. 2005–2009: Deputy Head of the Federal Treasury. 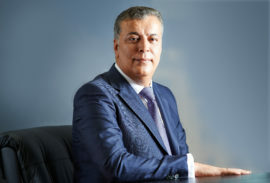 2009–2019: Deputy Chairman of the Management Board at Gazprombank (Joint Stock Company).